We're glad you stopped by. Please take as much time as you need looking through our site and getting better aquainted with us. We're here to serve your needs, so if you find yourself with questions or comments, click on over to the contact page and choose the method that works best for you to drop us a line. We look forward to hearing from you. We serve our home area of Buford, GA and into the surrounding cities and counties beyond. Our services include Home/Auto/Business lockout assistance as well as Rekey/Install/Repair/Maintain residential and commercial hardware alike. We also cut and program Automotive Transponder Keys (more commonly known as "Chip Keys"). Check out our Services page for a more detailed breakdown of what we have to offer. At Davidson Lock & Key, we are driven by a passion for perfection in everything we do. Slide over to the About page for more information on the history of the company. Your satisfaction and peace of mind are top priorities. 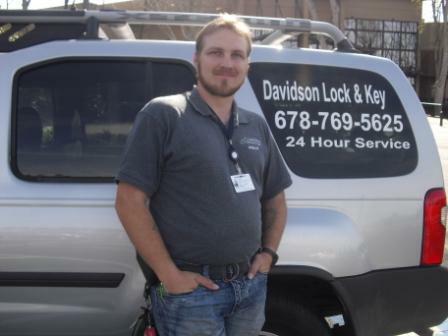 See for yourself what others are saying about Davidson Lock & Key on our testimonials page. The hours listed below are standard operating hours. We do answer and respond 24/7/365 for nights and holiday emergencies! There is no charge for small children locked inside a vehicle/home! Consumers Beware of Scam Locksmiths! List of other Real Locksmiths!